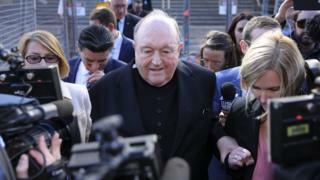 Philip Wilson, now archbishop of Adelaide, becomes the most senior Catholic in the world to be charged and convicted of the offence. Wilson will be sentenced in June and faces a maximum two-year jail term. What was heard in court? Magistrate Robert Stone rejected Wilson's claims that he had no memory of the conversation, and said he had found Mr Creigh to be a reliable witness. The priest knew "what he was hearing was a credible allegation and the accused wanted to protect the Church and its reputation", Magistrate Stone said. Another victim, who cannot be named, told the court he disclosed the abuse in the confessional box when he was 11 years old. He said Wilson told him he was telling lies and to recite 10 Hail Mary prayers as punishment. His lawyers had tried to get the case thrown out on four occasions, after the 67-year-old was diagnosed with Alzheimer's disease. In 2012, then PM Julia Gillard set up a royal commission, the country's highest form of public inquiry, to look into institutional responses to child sexual abuse. It said institutions including churches, schools and sports clubs had "seriously failed" to protect children. Catholic institutions came in for particular criticism. The president of the Australian Catholic Bishops Conference, Archbishop Denis Hart, offered an "unconditional" apology.